ATCHISON — People working on the movie had to keep it secret. Actors were told they could damage their careers by participating. Music rights were denied. The Motion Picture Association of America gave it an R rating, despite the complete absence of profanity, gratuitous violence and sexually explicit material. Even the powerhouse Christian broadcasting network K-Love initially refused to promote the movie, apparently fearing the “political” controversy. This was the path of “Unplanned,” the new movie that tells the true story of Abby Johnson, a clinic director for Planned Parenthood who had a life-changing conversion to the pro-life cause. 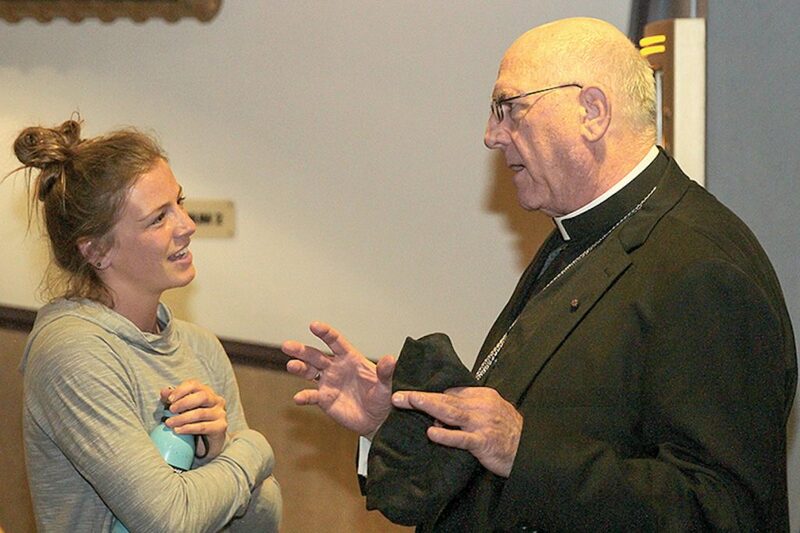 “Unplanned” found a strong supporter in Archbishop Joseph F. Naumann and Benedictine College in Atchison, however. The college and its student pro-life group, Ravens Respect Life, stepped up and answered the call from the Archdiocese of Kansas City in Kansas when asked to promote the movie. Along with two donors, Dr. Paul Camarata and Paul Danaher, the college rented an entire theater in a nearby AMC movie complex and offered the tickets to its student body, faculty and staff. Tickets to the advance showing on March 27 were gone in a flash and a packed house included Minnis and Archbishop Naumann, who is chairman of the U.S. Conference of Catholic Bishops Committee on Pro-Life Activities. He addressed the audience after the screening. “I think there is a lot to digest from this movie,” said the archbishop. “There are scenes that I find very difficult to watch, but it’s a movie about mercy and redemption. I think it is a movie that has the power to change hearts and lives. Shelley Laures, a senior nursing student at Benedictine, was surprised at how real the movie was and how people can convince themselves they are doing the right thing even in the midst of obviously horrifying circumstances. Danielle Boulanger, a Benedictine sophomore and president of Ravens Respect Life, has been very active within the pro-life movement for years and helped organize the movie preview. She was excited to learn about the impact praying at an abortion clinic actually has in decreasing abortions and thinks the movie will inspire people to stand up and take action. Jonah Hintgen, a junior at Benedictine College, gave a male perspective on what he had just seen. Hintgen said he had been active in the pro-life movement in high school, but not as much since he had been at college. Thanks for standing up for life and this incredible way.